4. Voyager Car Cover Fitted for Smart Roadster & Roadster Coupe for indoor/outdoor use. Established in 2005, here at CoverYourCar , we specialise in indoor, outdoor breathable, water resistant & outdoor waterproof car covers tailored for your car, yet at very sensible prices. We achieve these by producing our fitted car covers in large volume, using high quality materials and many years of expertise, but still offer that one off bespoke option, should you require a particular colour or something unusual. We recognise that there are many reasons for buying custom car covers. To help you choose simply select your Make Of Car from the Menu (left) and then select the cover you require. Advan-tex Ultimate Outdoor Covers are individually hand made to your choice of colours and specification, with optional Parking Permit Window. Only available currently for certain cars online. Available with an optional integrated alarm. Cielo 2 Tone Black & Grey, Bespoke, made to measure outdoor lightweight Car Covers of superior design and fit. 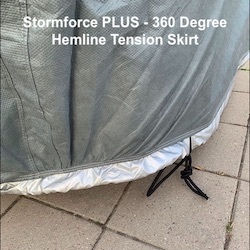 StormForce Our 4 Layer Luxury Car Covers are suitable for use indoor and outdoors. Four layers comprising a strong outer layer, water repellant membrane, padded protective layer, and a softer inner lining, providing the best possible protection for your vehicle. Now available with an optional integrated alarm. Monsoon Waterproof Winter Car Covers are best for long term outdoor storage during the colder months and where buying a totally waterproof car cover is important & paint & chrome need maximum protection. Voyager and Voyager PLUS Lightweight Car Covers can be used both indoors and outdoors. Their breathability, water resistance and UV protection make them a favourite choice for daily driven cars & medium term storage, where a totally waterproof car cover is not required. Also now available in Voyager PLUS format with our exclusive Hemline Underskirt. Sahara Indoor Fitted Car Covers are designed for 'in garage' use, both short & long term. Softech Luxury Stretch, Fleece Indoor Bespoke Car Covers made individually to your choice of colour. Guanto Covers are a unique stretch, form fit fabric for indoor and short term outdoor use. Available in Black or Grey with or without Print. Motorcycle Covers Indoor or Outdoor Bike Covers made to the same high standards as our car covers. Caravan & Caravan Towing Covers Made to Measure Tow Pro caravan towing protectors, and a complete range of custom made Caravan Covers of superior design and fit. Reveal / Launch Covers are again totally bespoke and made to launch your brand. Delivery to anywhere in the UK is £5 for single or Multiple Covers going to the same address. Stormforce, Monsoon, Voyager or Sahara Covers are normally delivered 2 working days from time of ordering via Fedex or DPD Courier and varies for international orders. PLUS Upgrades may take an extra few days. We accept, Visa, Mastercard, Maestro, Paypal, Cheque or Bank Transfer. See details Vanquish & S Coupe Luxury SOFTECH Indoor Bespoke Cover - Fully Fitted, made to order. See details Fiat 124 Spider (2016 on) Fitted CIELO Waterproof & Breathable Outdoor Bespoke Car Cover - Fully Fitted, made to order. See details New Shape FIAT 500 / Abarth Cielo Outdoor Bespoke Car Cover - Fully Fitted, made to order. See details Alfa Romeo GTV / Spider ADVAN-TEX Waterproof & Breathable Outdoor Bespoke Car Cover - Fully Fitted, made to order. See details Ford Focus inc RS and ST, GUANTO Soft, Stretch Indoor / Outdoor Bespoke Car Cover - Fully Fitted, made to order. See details Porsche GUANTO Soft, Stretch Indoor / Outdoor Bespoke Car Cover - Fully Fitted, made to order.